The Plant-Microbe Interactions Group specialises in the discovery of interesting new genes from plants and microbes, including microalgae. We use a Functional Genomics and Biodiscovery approach to study beneficial and parasitic interactions of plants with microorganisms. Arabidopsis is used as a model plant to study signalling pathways that enable plants to withstand pathogen attack or severe drought. The up- or down-regulation of specific key regulatory genes has led to disease resistance and drought tolerance, and this strategy is used to improve crop species. In our start-up company Nexgen Plants Pty Ltd, we are producing virus-resistant crops using a new molecular, non-GM approach (www.nexgenplants.com). We are using molecular profiling tools, such as functional gene microarrays and next generation sequencing, to characterise highly diverse microbial communities that are associated with plants to identify novel compounds for agricultural applications. This environmental transcriptomics (metatranscriptomics) approach captures microbial activity profiles with direct implications for crop cultivation (e.g. soil-borne diseases, greenhouse gas emmissions, yield increase or decline). This research has led to the development of new antimicrobial compounds to control plant diseases (www.plantsandmicrobes.com). We house a collection of Australian microalgal strains that are highly efficient producers of oil, protein and nutraceuticals and use a special non-GM breeding technique to further improve their performance. At present we are developing microalgae for animal feed and as a source of omega-3-rich oil for human consumption to provide a sustainable and vegetarian replacement for fishoil. Microalgae are also likely the only renewable source of fuel that could match our current and future demand without competing for arable land and biodiverse landscapes. For this reason, we have built the UQ Algae Energy Farm, a 250,000 L large-scale, low-cost algae demonstration biorefinery at Pinjarra Hills (www.algaebiotech.org). We have developed a low-cost filtration system that enables high-flow removal of microbial, colloidal and oil contaminants from water. For further information please contact us directly. 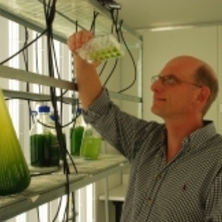 Research with notable impact includes (1) plant- and microbial protein expression systems, (2) disease-resistant plants, (3) new commercial canola varieties, (4) large-scale, low-cost algae cultivation and harvesting technologies, and (5) a new water filtration system to remove dangerous microbial and oil contaminants. Collectively, our work has led to 7 patents, two start-up companies and other commercial partners that bring our technologies to the market. We always interested to partner with industry to apply our technologies in a commercial setting. Effects of long chain fatty acid synthesis and associated gene expression in microalga Tetraselmis sp. Unravelling plant-microbe interactions: Can multi-species transcriptomics help? Investigation of virus-induced defence modulations during plant-virus interactions. Microalgae isolation, genetic improvement and improvement and transcriptional profiling for high-efficiency lipid production.